That’s the premise of Constellations, a play by Nick Payne, which ended its run at Trafalgar Studios in London on August 1, 2015. 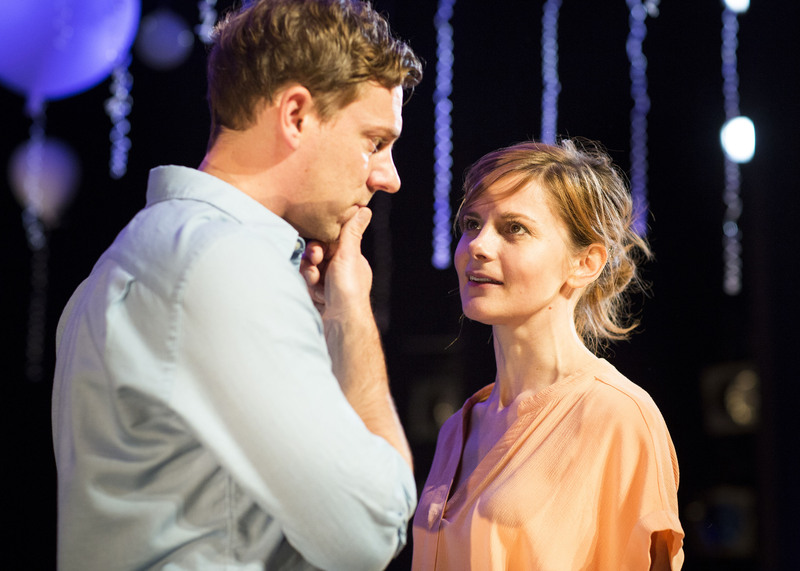 Starring Sherlock‘s Louise Brealey as Marianne, and Joe Armstrong (Happy Valley, The Village) as Roland, Constellations explores the various ways their relationship could have gone. Marianne is a physicist teaching Roland, a beekeeper, about quantum multiverse theory. At first, it is confusing to see the same scene played over and over again, until you realise that every time, little details change. The way the line is delivered, a different word here and there, a different reaction. Body language is paramount in this play, with its honeycomb-shaped floor, white balloon ceiling and nothing else to distract you from the emotions Joe Armstrong and especially Louise Brealey pour into their play. Louise Brealey has a talent for playing intelligent yet socially awkward characters convincingly, and her Marianne is disarmingly charming, even when she swears. On their practically empty stage, the actors have nowhere to hide. Without an interval or a supporting cast, their every move can be scrutinised by the audience. While the jumps back to previous points in Roland and Marianne’s relationship seem jarring at first, the audience soon wonders what direction they can take it next. For the actors, this means incredibly quick changes from one extreme emotion to the next. Where they were fighting and on the verge of tears in one scenario, they’re all smiles and in love in the next with only a split-second sound and light effect signalling the change. The way their relationship progresses and the challenges they face reach much deeper than you would expect from a witty play of 70 minutes. Next to quantum physics, the play also touches upon terminal illness and thoughts of euthanasia. This is off-set by hilarious scenes and a few socially awkward situations everyone can sympathise with, from unsuccessfully trying to chat someone up, to unexpectedly bumping into your ex. Joe Armstrong’s talent turns a short passage from a beekeeping text book into a very romantic proposal, which Roland barely gets out thanks to his nerves. But it is Louise Brealey, who steals the show again and again, as Marianne starts to lose her words, culminating in a touching and brilliant scene in which she communicates entirely in British Sign Language and the emotions she throws into the gestures, and still manages to come out on top in the argument Roland and Marianne are having. Verdict: It’s hilarious, deeper-reaching than expected, sometimes shocking but always charming. Constellations shows a down-to-earth relationship with all the ups and downs a couple could possibly face.